Aesthetically, it’s 60% Star Wars, 40% soapbox derby—a vision of the future as seen by someone from the past. On 23 August afternoon, the luxury automaker Infiniti, a unit of Nissan Motor Co., pulled the cover off a futuristic concept car at the Pebble Beach Concours d’Elegance in California, the de facto Super Bowl of classic-car shows. 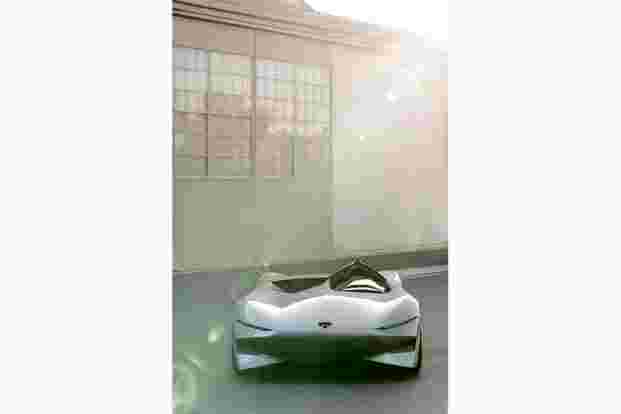 Dubbed “Prototype 10", the sinuous, all-electric machine “represents a physical manifestation" of the brand’s plans for sporty, battery-driven machines. “To my eye, the car has a ‘60s vibe to it," says Infiniti spokesman Kyle Bazemore. “It’s a flight of fancy, if you will, to give a nod to what is coming." At a time when much of the auto industry is bent on utilitarian transportation and soporific design, Infiniti’s skunkworks has provided a glimpse at an art deco future, like the jet pack from the film The Rocketeer, or the apartment building from The Jetsons. Last year, Infiniti had the sleeper hit of the Concours in its Protoype 9, a one-seat concept marrying the aesthetics of a 1940s race car with an electric powertrain and 21st century materials. The new iteration takes that formula and dials up the “future" elements. The vehicle is still long and narrow, like a vintage race car, and there is still only one seat, but the wheels are enclosed by a ribbon of seemingly uninterrupted metal. The hood goes for days, with giant concavities on the sides that funnel air into two intakes; the cockpit rises to a fin behind the driver’s head and then tapers down to the rear like that of a World War II fighter-plane. The cabin is open, of course—another nod to vintage speed. The driver sits, essentially, on the floor, behind a tiny, flat-bottomed steering wheel. In place of a passenger seat, Infiniti has carved a massive air duct. It can’t DJ or pull up iPhone directions, but the cavity cools the motor and batteries. It’s the first major machine drafted under the watch of design chief Karim Habib, whom Infiniti hired away from Bayerische Motoren Werke AG last year. As such, the concept may provide a telling glimpse at how Habib will tinker with the look of other vehicles in the lineup. Make no mistake, this whip will never see an assembly line. But it does help prime potential customers for an electric revolution at Infiniti, an imperative for every automaker at the moment. Vanguard executives figured out years ago that the best way for electric vehicles to shed their crunchy, green reputation, was to outrun it. The pitch: “Sure, they’re sustainable—never mind that, let’s talk about the speed." Porsche’s 918 brought electric motors to the supercar segment in 2013. With a price tag just shy of $1 million and an all-electric range of 18 miles, the machine promptly shattered the track record at Germany’s storied Nurburgring by 14 seconds. Two years later, Acura followed a similar strategy with its all-new NSX, a hybrid sports car that uses three electric motors to make 573 horsepower. In short, the main goal for the Prototype 10 is to make Nissan fans forget, for a moment, the Nissan Leaf, the concept car’s whip-smart, earnest electric sibling. That car is decidedly unsexy. It doesn’t mean all the company’s gas-free offerings have to be. Infiniti itself is currently near the back of the pack on the electric race; in June, it sold about 30 hybrids in the US, while Lexus hawked 2,600. However, it plans to catch up quickly. It has promised that all of its cars from 2021 onward will have some form of electric propulsion, echoing similar pledges from Mercedes, Volvo, and others. Nissan’s faithful can only hope some of them are nearly as fetching. The company recently unveiled the EQ Silver Arrow concept car—a homage to the brand’s W 125 race car, which in 1937 set the record for fastest land-speed vehicle on a public road by travelling nearly 270 miles per hour. That record was only broken last year by the Koenigsegg Agera. The car has a carbon-fibre front splitter and side skirts with a lighting strip. The “Alubeam Silver" paint work on the body is similar to the type used on the original Silver Arrow cars. The maker of the AK-47 rifle is another entry into the electric-vehicle race. The car, dubbed the CV-1, comes with a design that echoes the Soviet Union’s Izh-Kombi, a car popular in the 1970s. Kalashnikov showed off the car, with a broad front grille and a 350km driving range, at an arms fair in Moscow recently. The CV-1 will help Kalashnikov enter the ranks of electric-car producers like Tesla Inc. and become a competitor, the manufacturer told news agency RIA Novosti.